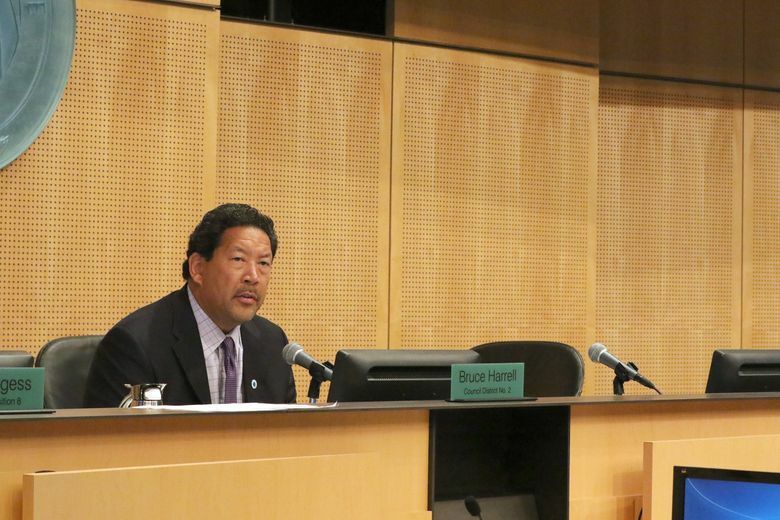 Critics of Seattle’s plan to spend as much as $149 million to build a new North Precinct for the Police Department packed the City Council’s chambers and spilled into an additional viewing room Monday as the council prepared to weigh in. 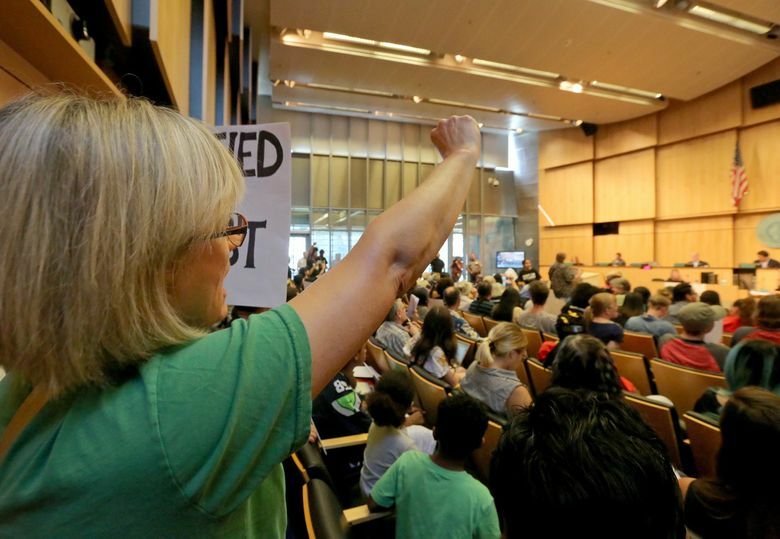 That was one activist’s message Monday to other opponents of a new police precinct that Seattle Mayor Ed Murray plans to build. Its price tag: as much as $149 million. “Block the bunker! Block the bunker!” the project’s foes chanted after a combative City Council meeting punctuated by passionate testimony and angry shouting. The council ended the meeting by passing a resolution directing the city to conduct a racial-equity analysis of the precinct’s design and subject the price tag to more scrutiny. But the resolution didn’t satisfy many of the more than 100 people who showed up at City Hall to call for scrapping the long-planned North Precinct replacement project. 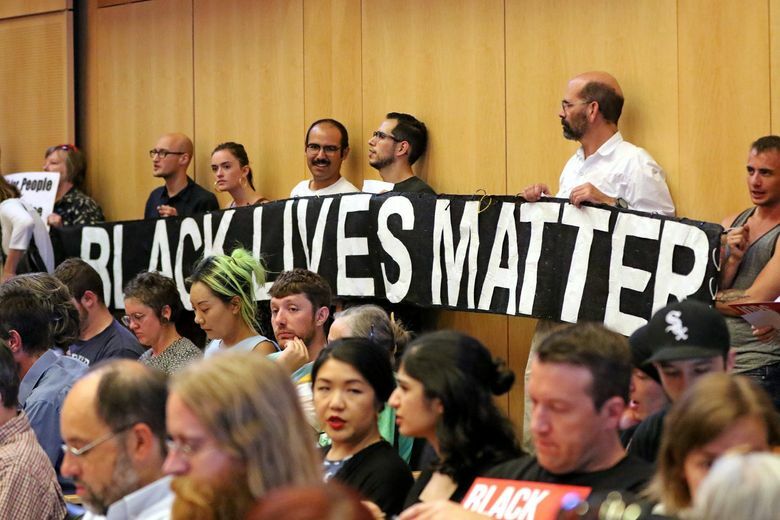 Holding signs with slogans such as “Black Lives Matter,” they questioned the cost and the city’s priorities, urging the council to keep Murray from spending so much money on a department undergoing court-ordered reforms related to excessive force and bias, and in a city with thousands of homeless people. 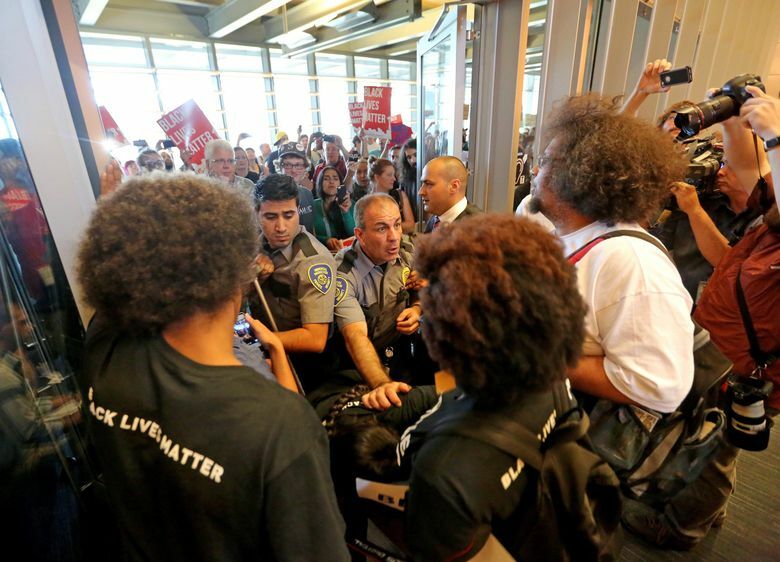 Several mentioned instances of police racism and brutality, and argued against “rewarding” the department for bad behavior. Others said $149 million would be better spent on affordable housing. 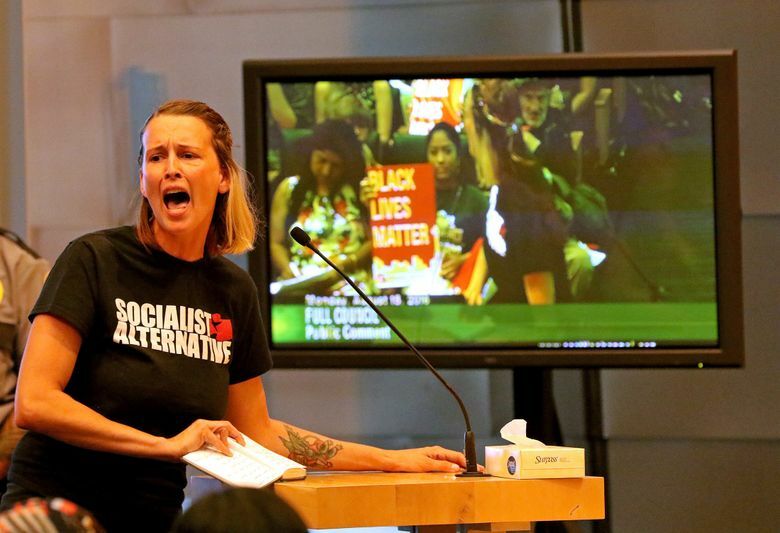 “If y’all vote for this, you are negligently treating the citizens of our city most marginalized by the police,” Nikkita Oliver warned the council. The people trying to enter the meeting had been watching on a projection screen in an overflow room on a lower floor before moving en masse to the chambers. 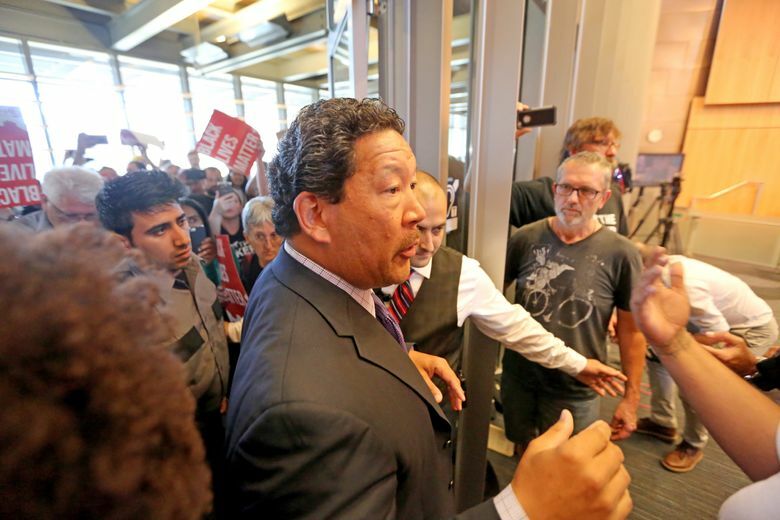 Unable to bring the situation at the doors under control, Harrell abandoned the chambers, as his council colleagues already had, and the meeting briefly shut down. The council members returned after about 15 minutes, and the meeting resumed with the doors open and the crowd spilling into the hallway. The drama stemmed from a project that’s come under fire in recent months. The city has for many years been crawling ahead with a plan to build a new North Precinct at Aurora Avenue North and North 130th Street to oversee all of the Police Department’s operations north of the Lake Washington Ship Canal. 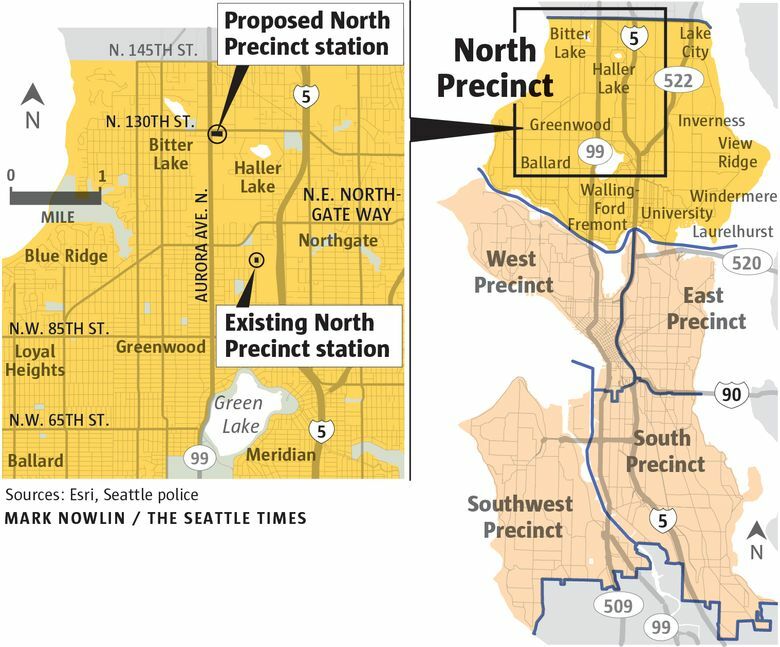 The new precinct is needed, according to officials, because the existing North Precinct at College Way North and North 103rd Street is overcrowded and rundown. The price tag for the project was initially an estimated $89 million, but it was changed to $160 million under Murray, possibly making it the most expensive police precinct in the country. In response to concerns expressed by council members and citizens, Murray agreed to shave about $11 million off that figure last week by cutting the size of a parking garage for officers and by waiting, if necessary, to build out a basement training facility for officers and to install some solar panels. An earlier version of the resolution crafted by Councilmember M. Lorena González would have capped the project’s budget at $149 million. But the updated version passed Monday makes no such commitment, leaving open the possibility of additional reductions and ensuring that debate over the price will continue during council’s fall budget talks. The equity analysis required by the resolution will cover the precinct’s “design and operations” with an eye toward “the elimination of racial and social disparities” and will involve officials soliciting the views of various demographic groups. Councilmember Mike O’Brien moved to shelve the resolution in order to discuss the precinct plan more with community members, but his effort was rebuffed. Only O’Brien voted against González’s resolution. Councilmember Kshama Sawant, who opposes the project, scheduled for construction in 2017, was absent. Councilmember Tim Burgess said an improved precinct can help the Police Department carry out officer trainings related to the court-ordered reforms, while Councilmember Debora Juarez described the project as necessary for public safety. González’s resolution says the council intends to appropriate funding for the new precinct this fall and to approve a new price tag. But it also directs the city to hire a third-party cost estimator to check the project’s budget for fat after the precinct is 60 percent designed and again at 90 percent.